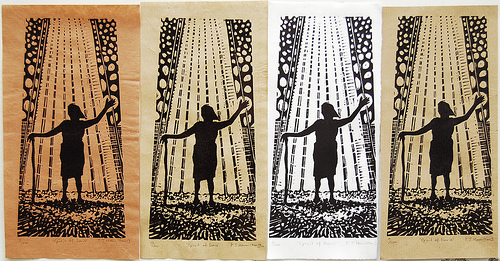 The lady who launched, a great woman of the stones who said to me.... "The beach will always give you a living..."
The spirit of Doris - Arches paper edition - Lino cut Print 1 - 15 cm x 35 cm. 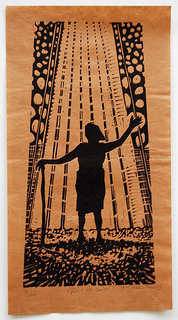 The spirit of Doris - Antique brown paper lino cut Print 2 - 15 cm x 35 cm. The spirit of Doris - Kraft + Lino cut Print 3 - 15 cm x 35 cm.. 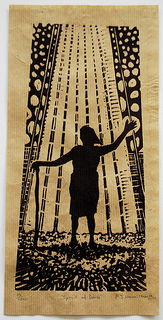 The spirit of Doris - American Deli + Lino cut Print 4 - 15 cm x 35 cm..
Dimensions - 15 cm x 35 cm + borders - Linocut prints in Dark brown shade on Arches or brown papers- Total edition of 100 - Numbered, titled, signed, dated.